The ACCC’s annual Container Stevedoring Monitoring Report has found that while stevedoring operating profits per TEU have risen by over 25 per cent in 2016-17, competition levels are set to increase as there are now three stevedores competing at the nation’s three largest container ports. “Competition has significantly increased in recent years with the introduction of a third stevedore in Sydney and Brisbane, and now we can add Melbourne to that list. As such, we expect to see greater levels of price competition as new entrants and incumbents compete for market share,” ACCC Chairman Rod Sims said. “However, this remains a critical period for competition. For sustainable competition to develop, these new entrants will need to win a commercially viable share of the market,” Mr Sims said. Both DP World and Patrick recently either introduced or substantially increased ‘infrastructure charges’ at a number of ports for transport companies collecting or dropping off containers. The stevedores claim that the higher charges are necessary because of rising property costs and the need to fund new investment. While there is merit to the stevedores’ claims about higher property costs, their overall costs remain stable. 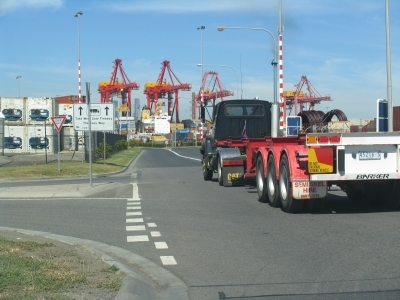 “Whilst it is true that the stevedores are facing higher property costs, the ACCC will be interested to see whether these infrastructure charges are used to improve landside facilities beyond business as usual levels,” Mr Sims said. Some organisations approached the ACCC with allegations that the new infrastructure charges may have been in contravention of provisions of the Competition and Consumer Act 2010. Most of the concerns were that the price increases were excessive, but there are no provisions in the Act to deal with excessive pricing. Shipping lines benefitted from lower prices as the stevedores reported falling unit revenues in 2016-17. Stevedoring revenue fell 4.5 per cent to $138.8 per TEU. This has continued a very consistent trend as unit stevedoring revenue is about a quarter less than a decade ago in real terms. The number of containers passing through Australia’s ports is the highest ever recorded. In 2016-17 Australian stevedores handled 7.2 million TEU, an increase of 3.7 per cent. The report also found that quayside productivity remains close to record levels. However, both capital and labour productivity fell slightly. “The stevedoring industry is not reporting the same level of productivity improvements that we have seen in previous years. With the new stevedores now in place along the east coast ports, we will be looking for this productivity growth to return in future,” Mr Sims said. The ACCC’s Container stevedoring monitoring report 2016-17 report is available here.